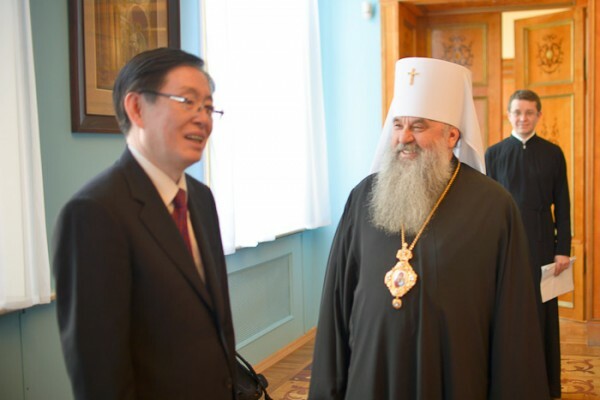 On 13 July 2014, at the diocesan administration of the St. Petersburg metropolia, Metropolitan Varsonofy of St. Petersburg and Ladoga, Chancellor of the Moscow Patriarchate, received a delegation of the State Administration for Religious Affairs of the People’s Republic of China, led by its director Mr. Wang Zuoan. The delegation arrived in Russia at the invitation of His Holiness Patriarch Kirill of Moscow and All Russia. Metropolitan Varsonofy told the guests from China about the life of the Russian Orthodox Church, the restoration of churches and monasteries, training of clergy, development of social ministry and charity work, as well as about the cooperation between the Church and the state in important social and patriotic projects. Mr. Wang Zuoan expressed his gratitude to His Holiness Patriarch Kirill of Moscow and All Russia for the invitation to visit Russia and thanked Metropolitan Varsonofy for warm hospitality. Metropolitan Varsonofy of St. Petersburg and Ladoga gave a reception in honour of the Chinese guests. During the reception, they shared their views on the historic visit of the head of the Russian Orthodox Church to China. The Chairman of the People’s Republic of China, Mr. Xi Jinping, described it as the first visit of a religious leader of such rank to China, Mr. Wang Zuoan noted. After the reception, Bishop Nazary of Kronstadt, abbot of the Laura of St Alexander Nevsky, showed the Chinese guests around the monastery. The delegation from China visited the Laura’s necropolis. Archimandrite Iakinf (Bichurin), head of the 9th Russian Ecclesiastical Mission in China, is buried at the necropolis, among other eminent Russian people.